1. Display Series 1:900 scale. Detailed full hull models, on wooden bases with clear covers, brass nameplates. 2. Collector's Series 1:1250 scale. Detailed waterline models on blue acrylic bases with clear covers. 3. Souvenir Series 1:1250 scale. Simplified versions of Collector's Series models without cases (cases are optional). Scherbak ship models are the best memos and gifts for Cruise Weddings, Honeymoon Cruises, Anniversary Cruises or any Cruise Vacations. They will always awake memories of your wonderful time and events at sea. Our models are not mass produced cheap product - but very small editions of time consuming and labor intense state-of-the-art miniatures handcrafted with love, skill and knowledge. ​ We do these models for ourselves and friends and proudly display them around our house and office as travel and adventure memos. We always make several extra models for you - people of the same spirit, so please join us - collect models of cruise ships you have sailed on! The models shown on our website are original products developed by Scherbak Ship Models and can be purchased only under our name. Please be aware that there are other companies that have been pirating photos of our models to advertise their services. 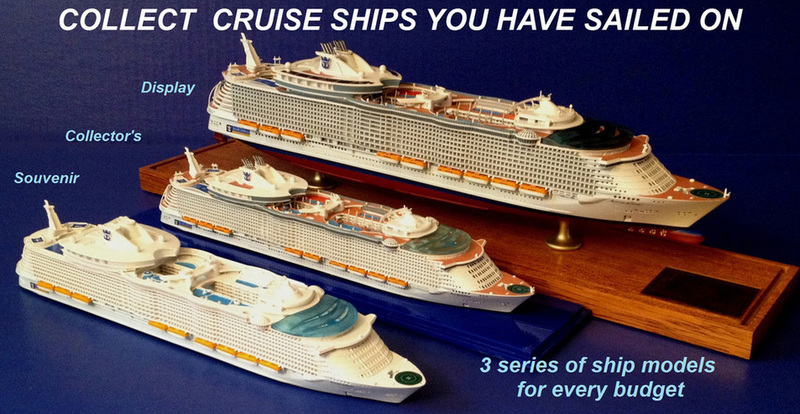 We produce limited editions of Cruise Ship Models, Ocean Liner Models and ID style Warship Models. We restore the best traditions of ship-modeling art from the time of Bassett Lowke, Van Ryper, Richard Wagner, Lloyd McCaffery and also much older times, including Napoleonic Prisoner of War and Dieppe Ivory carved ship models and develop our own style in this field of Nautical Art. © 2019 Scherbak Ship Models. All Rights Reserved.